The global veterinary therapeutics market has witnessed growth at a significant rate in the past few years, owing chiefly to the rising awareness about health and well-being of companion as well as livestock animals. The market is driven by factors such as the increase in ownership of companion animals, rapid introduction of new products capable of combating new varieties of diseases in animals, increased affordability of treatments, and rising expenditure on animal health. Transparency Market Research estimates that the global veterinary therapeutics market will exhibit a healthy 6.7% CAGR over the period between 2016 and 2024. Expanding at this pace, the market, which had a valuation of US$26.9 bn in 2015, is projected to reach US$50.2 bn by 2024. Of the key product segments in the global veterinary therapeutics market, drugs emerged as the leading segment, accounting for a revenue share of 56.2% of the global market in 2015. Of the key varieties of veterinary drugs examined in the report, the segments of anti-infectives and parasiticides collectively accounted for dominant share of the drugs segment in 2015. These segments are also estimated to dominate the market over the forecasting horizon owing to the high demand for preventive measures against various infectious diseases as well as endoparasites and ectoparasites. The demand for anti-inflammatory drugs is also expected to see a significant rise in the near future as the significance of pain management and the use of NSAIDs, especially in animals, has augmented radically. The segment of veterinary vaccines is expected to exhibit healthy growth in the next few years owing to development of novel approaches such as recombinant vaccines and DNA vaccines. The rising awareness about prevention and well-being of both livestock as well as companion animals is expected to boost the global demand for veterinary vaccines over the next few years. 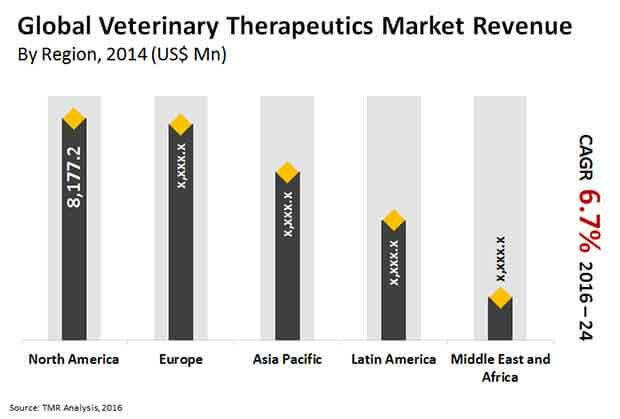 The global veterinary therapeutics market is well developed and earns a substantial share of its revenues from developed regions such as North America and Europe. However, regions such as Latin America and Asia Pacific also exhibit significant potential for healthy growth of the veterinary therapeutics market. The market for veterinary therapeutics in North America presently dominates the global market. Factors such as the presence of superior animal health care base, strong economic growth, increasing trend of pet ownership, and higher emphasis on the prevention of diseases by veterinarians and owners are key to North America’s dominance in the global veterinary therapeutics market. The region’s rapidly increasing demand for animal food products is also expected to propel the livestock animals segment. The segment of companion animals in the region is expanding owing to factors such as the rising pet population and introduction of new product by global players. In Latin America, which is expected to emerge as one of the most promising markets for veterinary therapeutics, the rising capacity of meat production in countries such as Brazil is compelling several global players to increase their presence to exploit the vast growth opportunities that the region has to offer. Latin America is expected to emerge as one of the leading meat exporters in the world over the course of the next few years. Hence, market vendors are investing in the region to manage the potential rise in demand for drugs, vaccines, and medicated feed additives for the future rise in population of livestock animals. Many domestic vendors in the region have increased their focus on the specialization of swine therapeutics. The segment of poultry therapeutics is also expected to be an attractive area for investment in the region over the next few years. Some of the key vendors operating in the global veterinary therapeutics market are Boehringer Ingelheim Vetmedica, Bayer Animal Health, Inc., Dechra Animal Health, Ceva Sante Animale, Elanco Animal Health, Merck Animal Health, Virbac S.A., Merial Animal Health, Zoetis, Inc., and Vetoquinol S.A.